RPSC RAS/RTS answer keys: The answer keys for the Rajasthan Public Service Commission, RPSC RAS/RTS examinations have been released on Thursday. All the candidates who have appeared for the examination can download the answer keys from the official website, rpsc.rajasthan.gov.in. Results are likely to be announced soon. This year, around 4.97 lakh candidates had registered for the examination, out of which, 3,76,762 candidates appeared for the examination that was held on Sunday, August 5, at 1,454 centres. There are 980 vacancies in various government offices in the state. 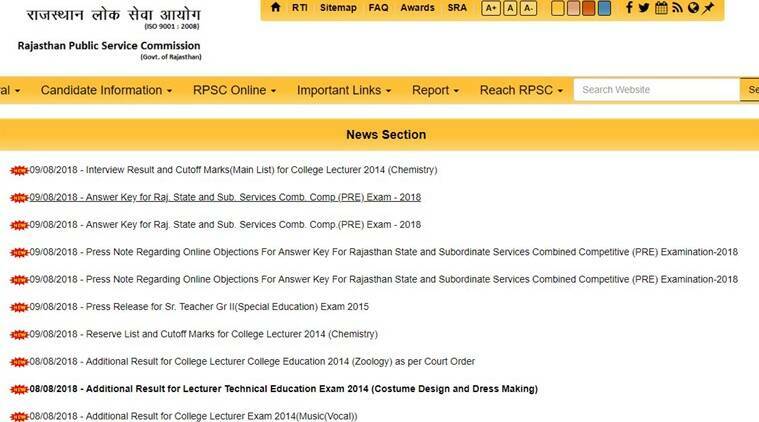 The commission has already uploaded the question papers at the official website, rpsc.rajasthan.gov.in. Step 4: Download the answer key to your computer and save a copy for future use. Step 5: You can also take a print of the answer key further analysis of your answers. Every year, the Rajasthan Public Service Commission (RPSC) advertises vacancies for posts for officers in various departments of the government. This includes the recruitment of clerical cadre, Rajasthan Administrative Service (R.A.S) and Rajasthan Police Service (R.P.S). The recruitment to RAS, RPS, RTS and Rajasthan Sub-ordinate Services is done through an entrance exam.